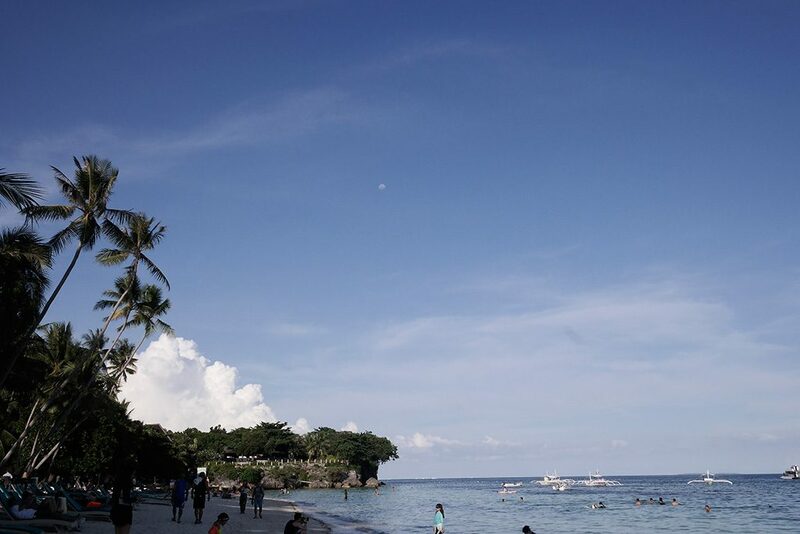 When travellers refer to Bohol island in the Philippines, they are more likely to mean «Panglao island» as this is the island where the famous Alona beach is located on. The islands are extremely close each other and are connected with two bridges- in fact, Panglao and Bohol are like David and Goliath respectively! 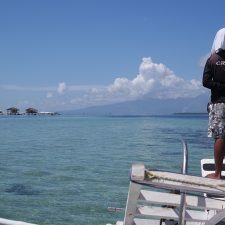 I summed up a Bohol itinerary with things to do that actually cover both islands. The suggested itinerary can be done in either 4D3N or 3D2N (by combining day 2 and 4). 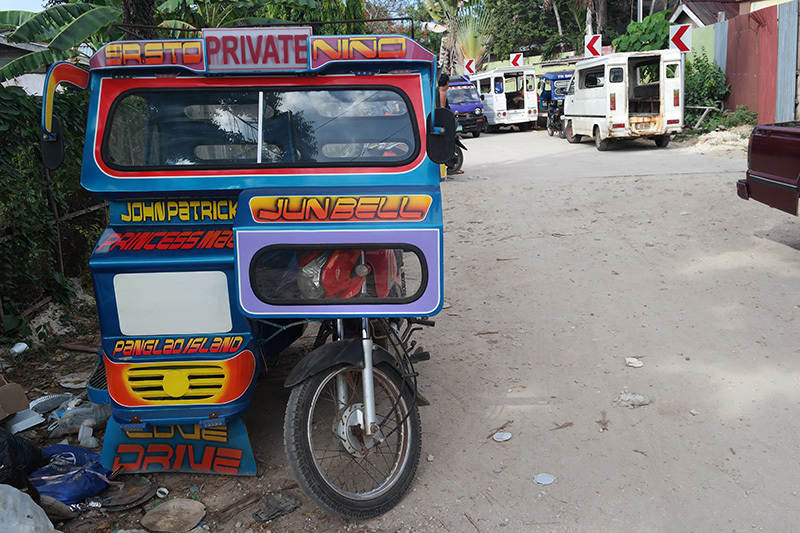 To squeeze everything in (as Bohol is quite big) I have skipped some important places such as the north part of Bohol, waterfalls, churches, Lοboc village, the butterfly garden etc. 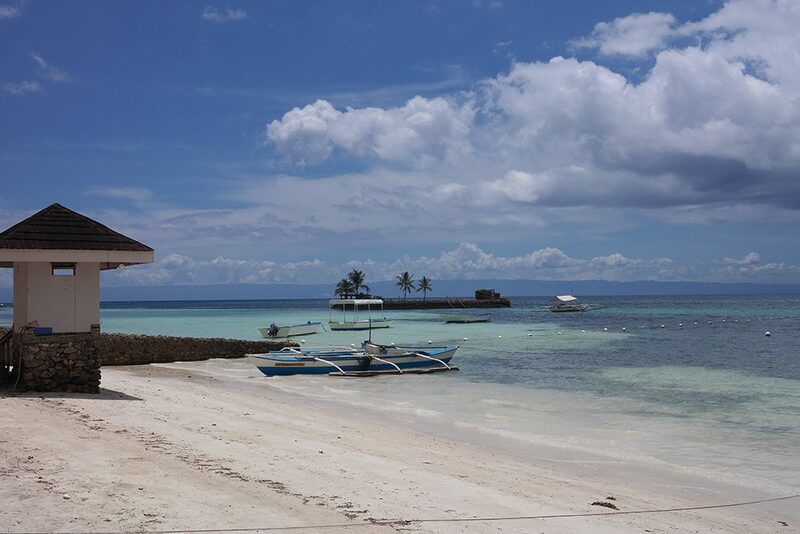 My recommended duration for Bohol – Panglao (especially if you enjoy relaxing in the beach and travelling slowly) would be at least 6-7 days. Day 1. Wander around Tagbilaran and take a nap ! 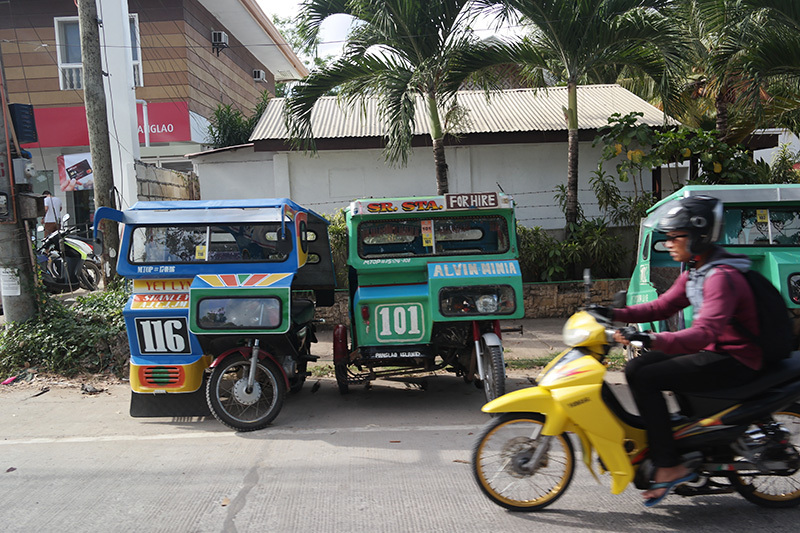 The public transport is actually one choice : the lovely jeepneys; other than that you have two options either to rent a motorbike or to take tricycles («taxis») . In my point of view, having your rental vehicle is the best solution for proper beach hopping in Panglao and small excursions around Bohol! However, keep in mind that you have to drive more than 75 minutes from Panglao to the Chocolate Hills (Carmen Complex) that is just in the centre of the island and not even the remotest area! If you just aim for relaxing holidays simply rent a driver with their tricycle for 1 – 2 days to drive you around the highlights. It is obvious what Dimitris chose for the day! The man-made forest is an area of thousands mahogany trees planted by locals. You can stroll around, enjoy the fresh air or have a picnic. 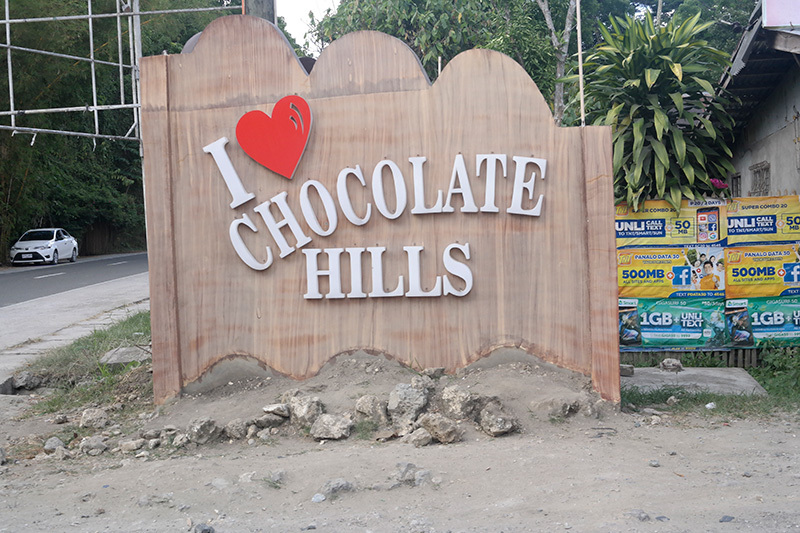 Chocolate hills are the gem of Bohol! 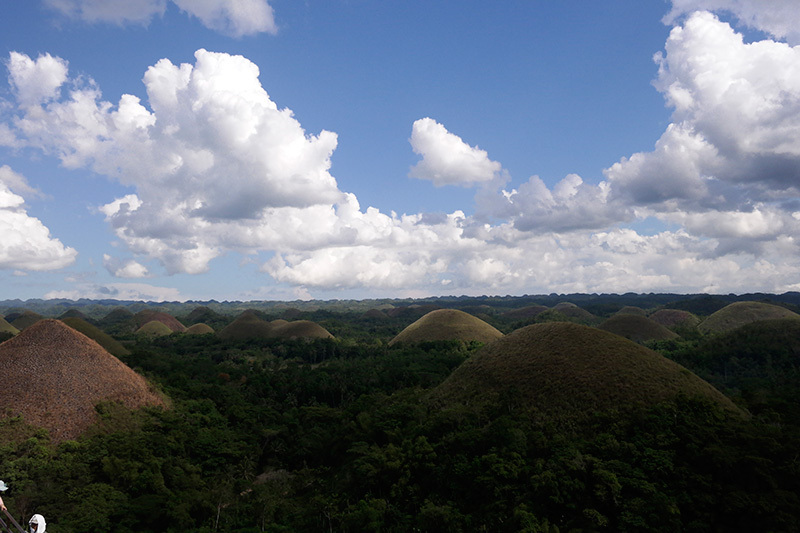 More than 1250 conical shaped green hills that turn into brown (hence the name!) throughout dry season are spread over an area of more than 50 sq. kilometres. 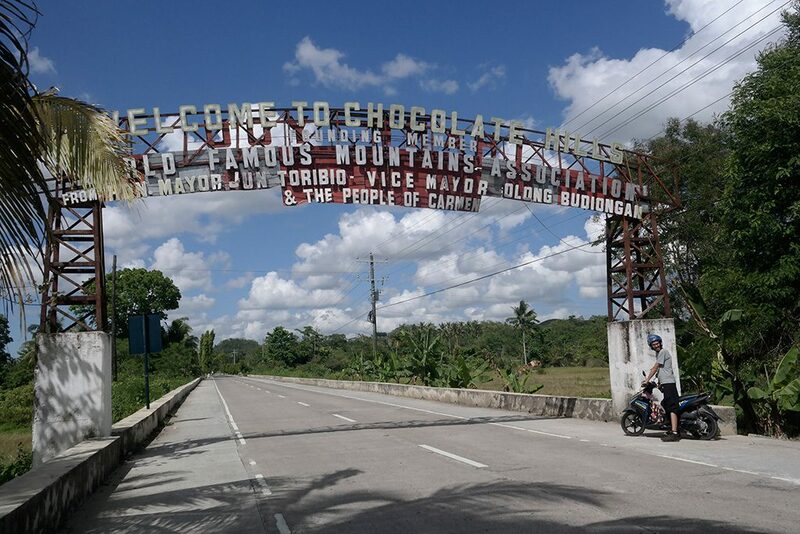 Chocolate hills Complex can be reached either through Carmen or Sagbayan town. Both places are very touristic with a small entrance fee and some stores, cafes and restaurants around. Stunning views guaranteed! The abovementioned attractions can keep you busy all day long, along with the small local villages you pass by throughout the route. 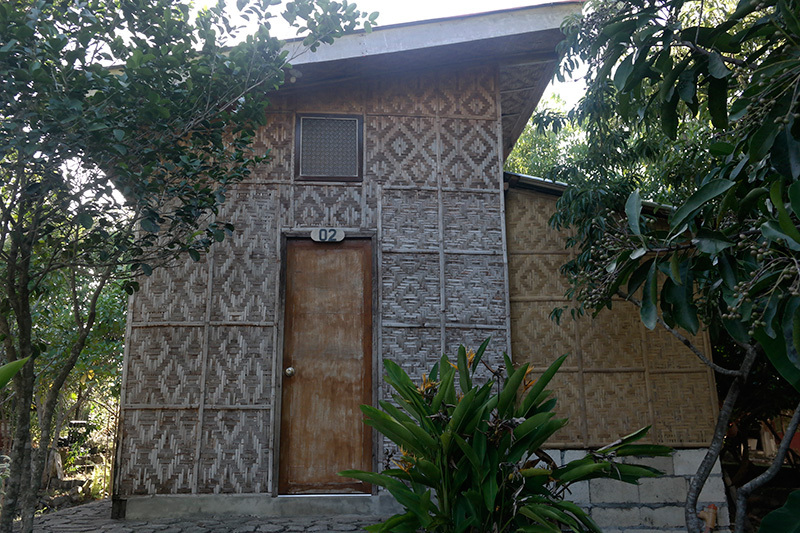 If you take the less touristic road (via Batuan village) nearly every local will greet you – Filipinos are so hospitable people! 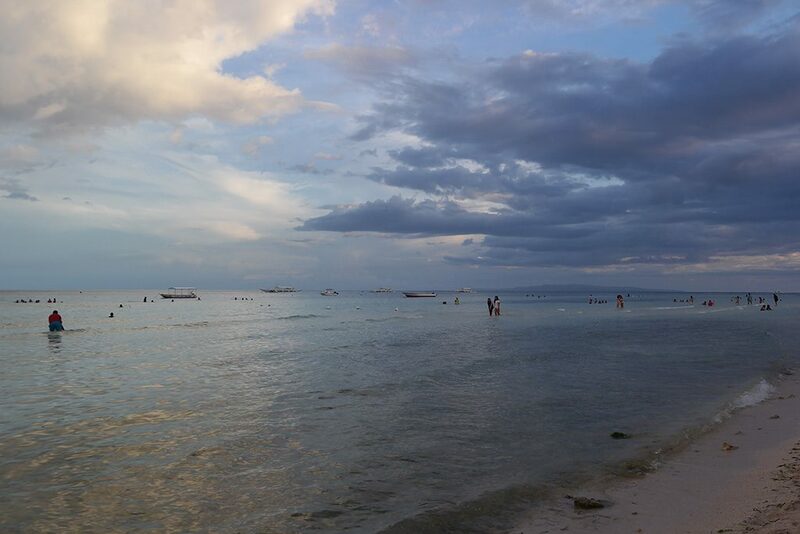 Most of the visitors prefer to stay in Alona beach or very close by. The area is very touristic with resorts and any kind of restaurants and entertainment. We even found out a Greek tavern! As the beach can be very crowdy (you have to pay for parking!!) we decided to stay 15 minutes away, in the unknown Bikini Beach which is very remote considering the bad road quality but we didn’t regret it at all! The funniest moment was when we discovered a random sandy beach full of local kids and we tried to swim for a bit… such a great mistake! In no time we found ourselves encircled by 20 kids which were extremely curious about everything, for example my legs: «why you don’t wear trousers?» – Filipinos usually swim with their clothes or long sleeves/shorts swimwear, no bikinis! We enjoyed chatting with them (I wish I knew such good English at their age!) and we headed to Alona beach. You may have to pay entrance fees (depending on the season) here and at the nearby Dumaluan beach. Most of the rest beaches are either free or occupied by resorts. Don’t be discouraged by the poor conditions of the roads. 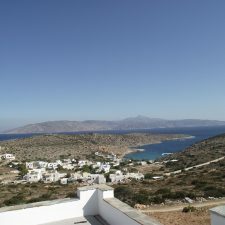 In fact, some of the most interesting resorts and scuba diving centres are far from the main road and the crowds. If you are up for swimming in the morning the Hinagdanan cave is the answer! With a small entrance fee you can enjoy a 30-minute dip in cold water along with the views of stalactites and stalagmites. What’s next? Tarsier is one of the smallest primitive in the world and Bohol is the proud motherland of the Philippine specie. 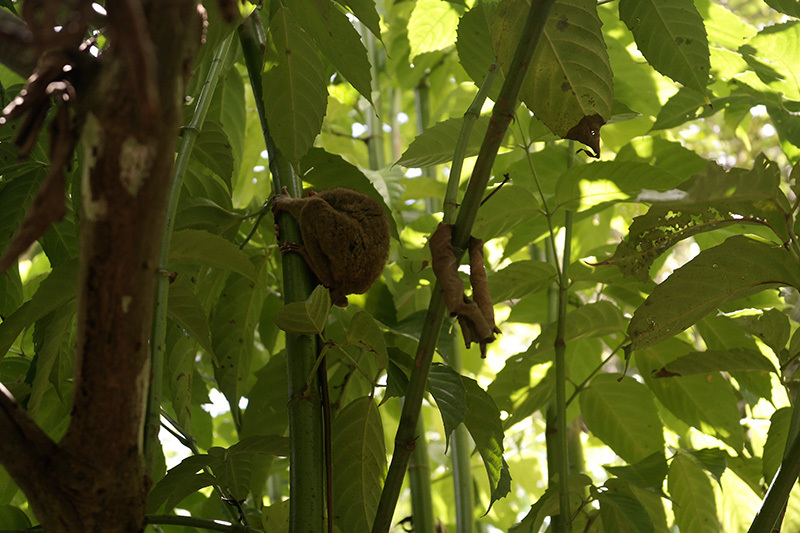 The Tarsier Sanctuary is located within 1 hour from Alona and it s actually built inside the tarsiers’ natural environment. Neither imprisoned animals, nor anything else that recalls a zoo! 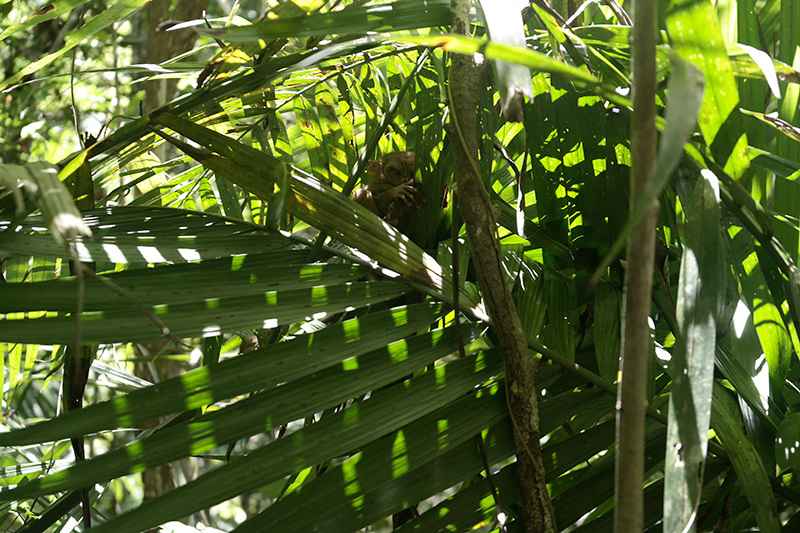 The tarsiers live in the forest and do whatever they would do anyway! 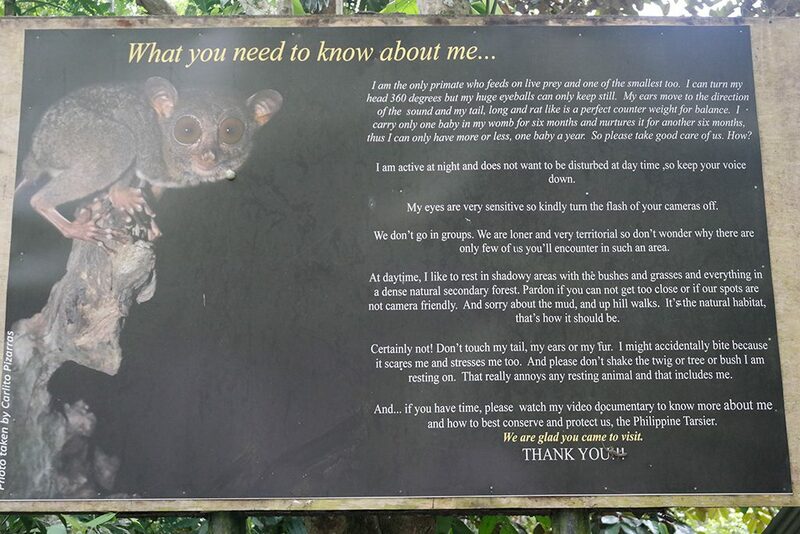 Each morning the guides walk around to locate the tarsiers and then they remain there in order to indicate the animals to the visitors. Tarsiers are so tiny that would have been definitely skipped otherwise! You have to be VERY quiet as the cuties are also very sensitive and can commit suicide when stressed! Last but not least, nightlife can be an important part of the itinerary if you wish so, especially when you plan to stay in Alona beach- live music, bars next to the sea and small gigs are just few of the options here! 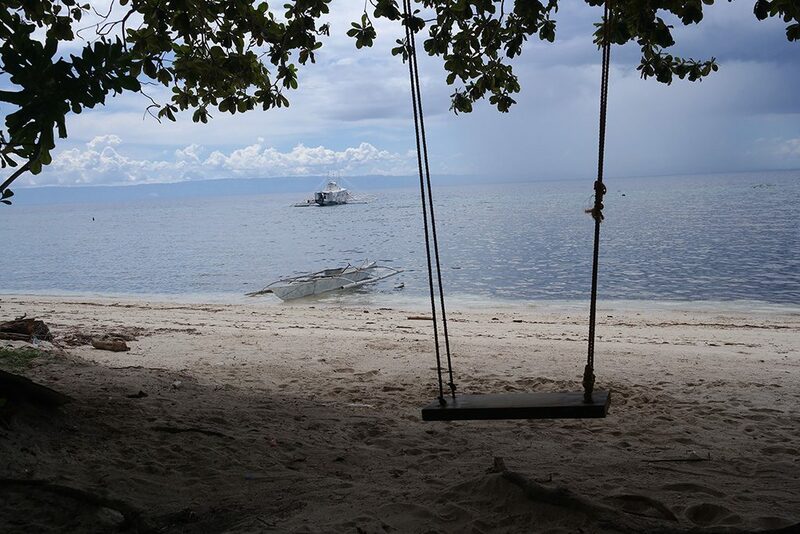 Well, Alona is nice but too busy for my taste, I am sold on the small, almost private beaches! Never been to the Philippines yet, but it’s always great to stumble on articles about places that are on my to do list! Especially when they are enjoyable like yours! What a wonderful adventure! We have never been to this part of the world but it looks like it would be lovely to explore. The private beaches look magical. Thanks for introducing me to somewhere I’d never heard of. San Pedro Bigang Beach looks really peaceful. The Philippines looks like a lovely country to visit from your photos. I the beaches you found look beautiful and peaceful. Chocolate Hills and the colourful taxis look interesting and fun. I heard the Phillippines have some amazing islands, Bohol sounds like one of them. That is so interesting that most people swim in long pants. I love the locals planting trees, must be beautiful. 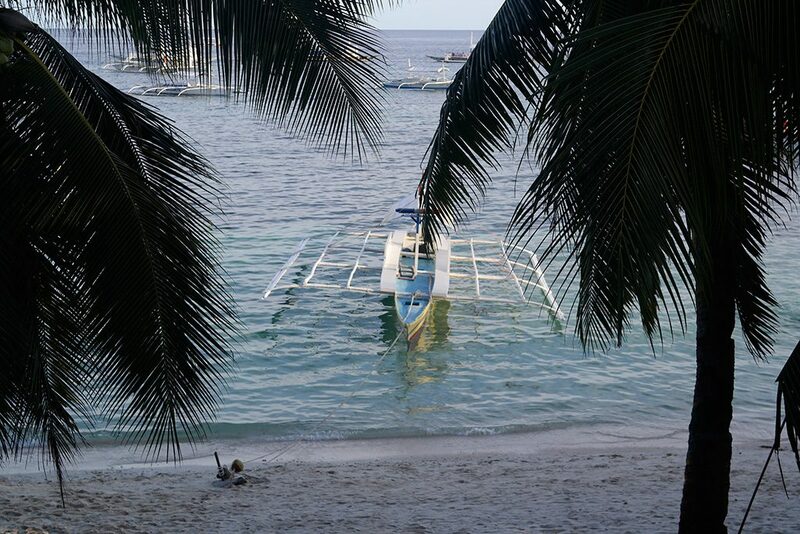 The Philippines is a country with a seemingly inexhaustible treasure of lovely places. The exotic islands and gorgeous beaches are indeed a paradise for nature lovers. 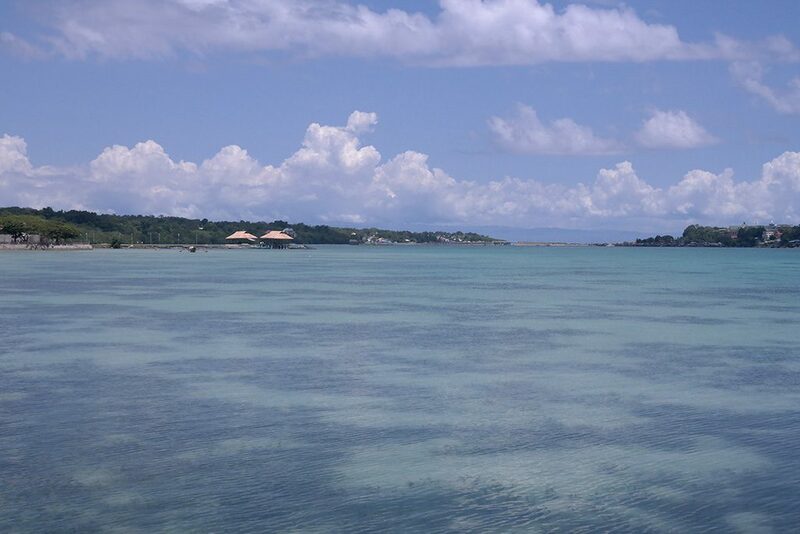 Bohol is a gem here with a promise of great times. The Chocolate Hills and Alona beach look so inviting. This is a wonderful itinerary that you have drawn up, will stand the first time traveller in great stead. I feel like taking a quiet beach vacation after reading your post. Its raining along the coastline in India, but its nice to see the sun in Bohol. The san pedro beach and the tarsiers sanctuary are post card worthy. 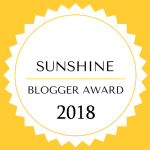 Nice post and thanks for letting folks outside know about little gems in the country! That sound (and looks) like the most fabulous time! Added to my Bucket list! Sounds like a great place to spend a few days. I am with you and would prefer the quieter and more relaxed parts. Those beaches look amazing! Error: Error validating access token: Session has expired on Tuesday, 02-Apr-19 16:48:27 PDT. The current time is Thursday, 25-Apr-19 11:53:14 PDT.